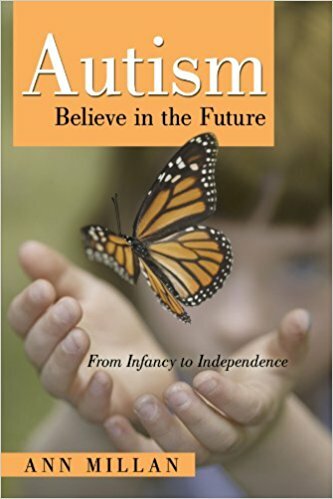 Ann Millan shares the story of how she helped her daughter, Robin, move past the many challenges of severe autism in Autism-Believe in the Future. Her first goal was simple; she wanted to stop the screaming, running, and self-injurious behaviors that her daughter exhibited. For ten years, Ann was told by professionals that she needed to accept Robin’s disabilities. Not one to give up in the face of adversity, Ann finally found quality professionals to help her. Ann knew education and therapies were Robin’s priority, but self-image and socialization became her focus. Ann also knew Robin’s inappropriate behaviors were unacceptable in society. Ann and her husband, Bob, became Robin’s case managers and Robin progressed beyond their wildest dreams. Autism is not a one-size-fits-all disability, so focusing on just one intervention did not lead Robin to successful adulthood. Many steps had to be taken along the way to get her successfully to her goal! Parents and autism professionals must work together, developing quality support and services that are cost-effective-so we can all believe in the future for our children. Today, Robin has two jobs, lives in her own condominium, drives her own car, and is a part of her community. This is her story!